The Geochron allows any observer to determine what time it is anywhere in the world. The Geochron allows any observer to determine what time it is anywhere in the world. Physically the Geochron looks like a framed world map, about 2×3 ft. in size. 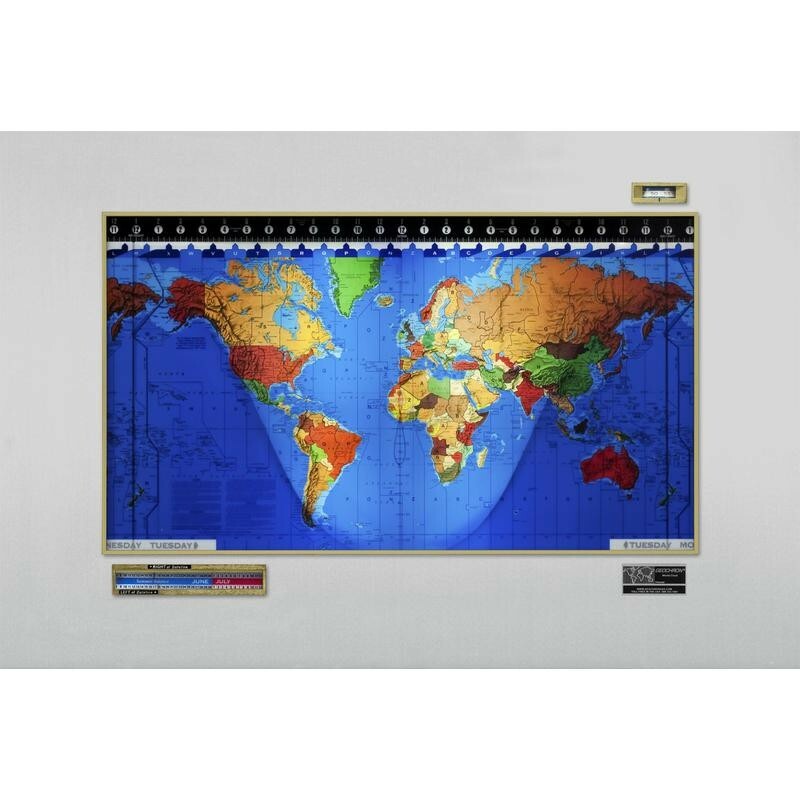 The colorful map itself is an endless belt that is driven slowly from left to right by an electric clock motor in synchronism with the rotation of the earth. All known legal time zone boundaries are delineated on the map by dark blue lines which in most cases, converge on lettered pointers on the top edge of the map. These letters identify the standard time zones and also represent the short wave radio prefix for that zone. Geochron not only shows you at a glance the exact time, but simultaneously indicates the date, the season, sunrise and sunset at any place on the globe. Thus, it is the ideal tool for business people to be in touch globally. Thanks to the Geochron’s attractive and eye-catching character it is suited for any professional or private environment such as reception rooms, banks, hotels, travel agencies, etc. Through its attractive eye-catching appearance it has its place in any meeting room, representing office or reception area, etc. It is obtainable in many different finishes and is hung on the wall like a painting requiring only an electric outlet. Not only will it bring a new dimension to your office or your home, but can be a prestigious present for important customers. A Geochron was offered by President Reagan to President Gorbatchev during one of his visits to the United States and is hanging in many representative places such as in the United Nations.